Any hunter should have a good understanding how these three factors influence the performance of your shooting and how they can be adjusted. Most high-end rifle scopes allow to adjust these three factors. You might find some lower end or older scopes where the parallax has been set at the factory and can’t be adjusted. Most scopes allow to adjust these three factors in specific increments. The most common are in inches, 1/4- or 1/8-inch increments, or in MOA (minutes or angle). Each click on any of the adjustment knobs on your rifle scope represents one of those increments. You will have to look at the manual of your riflescope to find out what the increments are measured in. Are we clear now? No? Well, a simple example of the impact of a parallax can be seen in your car. When you look at the speedometer and you sit in the drivers seat then the speed shows exactly what it is, e.g. 50. When in the passenger seat, you might think the speed is different as you have a different angle to look at the speedometer. The same happens when your eye moves away from the center point of the eyepiece. You suddenly have a slight distortion and your aim might be off. So, if you move your eye over the reticle you will see a shift or movement in your target. You will simply have to adjust the parallax until you can move your eye around the reticle and not have any more movement in the relation of your reticle to your target. At that time the parallax is perfectly adjusted and your first adjustment parameter is set. The first of three adjustments is done. Let’s move on. If your rifle scope doesn’t have a windage adjustment and is a rather new scope then you might have ended up with a rather low quality scope. Today’s higher quality scopes all allow for windage adjustment. Windage is the left to right adjustment of your reticle so your shot is centered left to right with your sight. Windage is commonly measured and adjustable in MOA. MOA is short for “minutes of angle” and that means in short that every click on the turret will result in an adjustment of about one inch at a 100 yard distance. To say it differently, if you adjust the windage by one click on the turret, your bullet will hit one inch left or right at a distance of 100 yards. This allows you to adjust for strong winds or other impacts during shooting. Not all scopes will be setup to adjust the windage by one MOA for each click. You will have to find out how your scope adjusts. Best is to do that with a bore sighter or simply performing some shots at a shooting range. You simply adjust the windage until your bullet hits exactly where your cross-hair says it will hit. This is done a lot cheaper with a bore sighter though. The elevation adjustment functions with the same principle as the windage adjustment. Where the windage adjustment is for your left to right targeting, your elevation adjustment is for setting your up and down impact. It’s exactly the same principle except for a different direction. The elevation adjustment is also measure and adjustable in MOA. Same as with the windge, you want to get a feel for it on a shooting range to know how many clicks you need to adjust the elevation correctly for long range shots. You can find the adjustment knobs/turrets on most riflescopes on the top or side of the scope. Be aware though that some cheaper models or older scopes do not have all the adjustment possibilities that modern and sophisticated rifle scopes offer. Many of these adjustments are very important for your shooting performance and can basically take you from average performance to outstanding shooting performance. 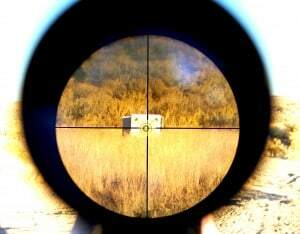 Just make sure that you take the time to learn about your specific rifle scope in combination with your gun. This will ensure that you get the best shooting results. Have a look at our riflescope reviews to find the best rifle scope for your hunting and shooting needs.